Looking for a pair of vegan platform boots without any real leather or animal products? You're sure to find something on this list. Let's have a look at the boots, shall we? Ladies' daytime ankle bootie with a 1.25" platform sole, a 4" wedge heel and crisscross buckle straps around the ankle. Has a brown fabric panel on the outer side like a Chelsea boot. Platform sole is uniquely layered with a brown faux leather upper half and a black synthetic lower half with a sawtooth edge. Footbed is lightly cushioned for comfort. Advertised as vegan: No, but these boots feature all man-made materials. Pros: A little casual, a little dressy and wearable all day long thanks to their light weight and padded interior. They're perfect fall boots for mixed textiles and extra long maxi skirts. Cons: They're a little pricey. 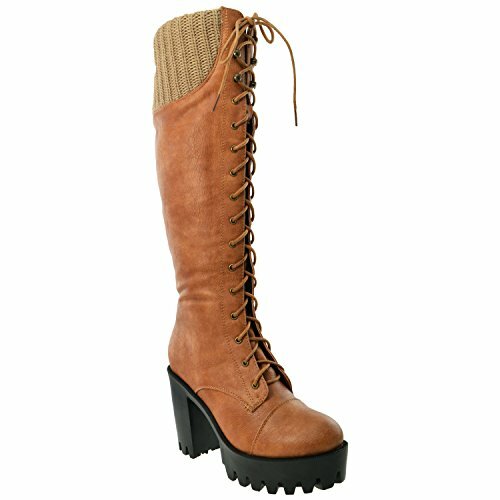 A hybrid of women's combat boots, knee high riding boots and fashionista glam with top-to-bottom lacing, a beige knit cuff and a black high-heeled platform sole. Brown synthetic leather boot with a round toe. Inner side zipper rises from the bottom of the foot to the middle of the calf. Has a lugged sole with a chunky 4" heel. Advertised as vegan: No, but the materials listed are synthetic. Pros: Stylish cool weather boots that complement your everyday jeans with a little extra glamour. An easy vogue look for a leisurely day out in the city. Cons: The lugged soles are a fairly hard material that don't have a ton of give when you walk. They're probably not suited to slippery surfaces. Cherry red faux leather ladies' ankle bootie with an almond toe and an adjustable buckle on the outer side of the ankle. Wrapped stiletto heel is 4.25" tall. Footbed is padded for extra support. Front of the boot has some subtle stitching detail. Advertised as vegan: No. However, these are listed as faux leather, all man-made boots. Pros: The stiletto heels are great for someone who doesn't dig the chunkiness of so many platform shoes. These are posh, elegant and dressy boots that can double as party shoes and slightly formal footwear. Cons: Given the super high stiletto heel, these might not be boots you'll pull out of the closet too often. This black platform ankle boot won't raise you too far off the ground with a 1" platform and 2" heel. Smooth, leather-like material is stylishly ruched over the vamp. Platform sole is textured with a flexible, grippy outsole. Features a patented Air Cooled Memory Foam insole for breathable comfort. Slip-on style with stretchy black side panels to help your foot into the boot. Collar and inner heel are cushioned for extended wear. Advertised as vegan: No, but the product description shows a man-made construction. Pros: Comfy, office-friendly footwear you could throw on to walk the dog or walk a near marathon in for all the comfort and durability. The black color and simple design flatter any pattern or color in your wardrobe and suit urban, casual and semi-formal environments. Cons: My run slightly large. Ladies' trendy velvet platform ankle boot in navy blue. Laces up in the front with a matching blue bootlace. Zips up on the inner side of the boot so you can get in and out with no fuss. Very in-style with an extra chunky heel and black platform sole. Advertised as vegan: No. Asos shows polyurethane and textile materials. Pros: These velvet boots are seriously on point with thick heels and high fashion appeal. You can't go wrong pairing these with some high waist paperbag pants or a long sleeve mini dress. Cons: In the moderately expensive range and only available in whole sizes. Women's haute couture ankle boot in lustrous black faux crocodile material. Platform and heel are super mod and tall for a catwalk experience. Boot zips in the back with a round metal pull. Pros: Modelesque statement boots with versatility for wearing with loose-fitting jeans or with a trendy side slit maxi skirt. Cons: Definitely not boots you could wear anywhere, but they are boots you'd want to wear to turn heads. 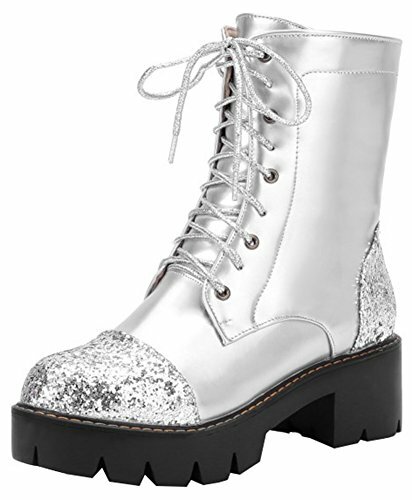 Funky ladies' combat boot in silver faux leather with sparkling silver sequins on the heel and rounded toe. Laces up in the front with a glittery silver bootlace. Black lug sole is slip-resistant and offers good traction. Platform is 1.25" with a comfortable 2" heel. Footbed is cushioned to support every step. Pros: Low-priced, edgy boots with diva flair. Totally walkable thanks to the relatively low heels and grooved soles. Because of the ample ankle coverage and slip resistance, you could probably wear them with warm socks in mild winter weather. Try these boots with rolled-up jeans and a button-down blouse. Cons: Not the most adaptable style — these are pretty tailored to an avant-garde look.